Yermo's main claim to fame, besides the horrendous Los Angeles/Las Vegas traffic on the weekends, is Calico Ghost Town. Calico was an old west silver boom town that produced over $20 million in silver ore during its heyday in the late 1880s. But when silver lost its value in the mid-1890s, Calico lost its miners and the town became a ghost town. Walter Knott purchased the town in the 1950s, restored many of the old buildings and later gave the town and its ghosts to the San Bernardino County Regional Park system. It's a great place to spend a day, wandering the old streets, taking the train ride and visiting the old mines. 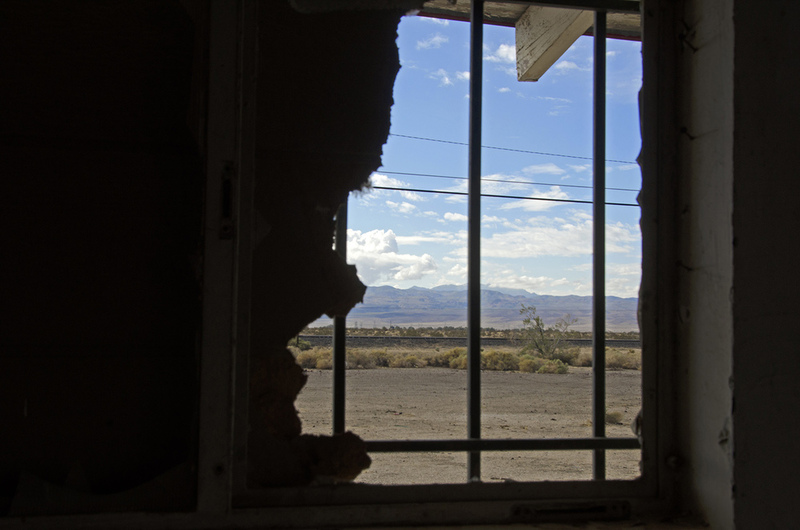 I was driving through Yermo after my Rock-A-Hoola adventure and stopped at several old, abandoned places to take these pictures. The census shows Yermo's population at slightly over 1,000 people, but I think they're spread out over a large area. And while my photos may make Yermo seem like a forgotten and abandoned place, those just seem to be the subjects I like to photograph. Something draws me to them, their past, the stories of the people who lived/worked in the buildings, their history. Click on any of the images to enbiggen them. This abandoned home caught my eye as I was entering Yermo from the east. Partially burned out, it seems to keep a silent watch on the highway a short distance away. Just a bit closer to town is this old Agriculture Inspection Station. At one time, this must have been quite a nice facility. There are several stone block buildings on the grounds, all damaged by fires no doubt set by vandals. These buildings housed restrooms, showers and probably a restaurant or quick food establishment. This station reminds me a bit of the one near Daggett, on Route 66. Near the edge of the business section of town, this old Gas Station sits just off the road, with several other abandoned establishments nearby. The town's general store, with another closed gas station in the background. This Cafe sign points to a cafe that is no longer there. It stands near the intersection of Calico Road and the I-15. I only drove along the town's main street, Yermo Road, but will probably be back someday to further explore the area to see what else I can find. If any of my pictures strike your fancy, in this or any of my other posts, feel free to right click and download the image. Use it however you like. Credit back to Cali49.com would be nice, but it's not necessary. Life's too short to worry about copyrights on photographs.